Baseball is a game of numbers, and there are always going to be some statistics and figures that are more memorable than others. Seventy-three home runs. A .406 average. A 56-game hitting streak. A 116-win season. With the Minor League season coming to a close this week, Toolshed looks back on what numbers put up by prospects defined the 2018 season and which will be the most memorable on down the line as these players continue to build their professional careers. 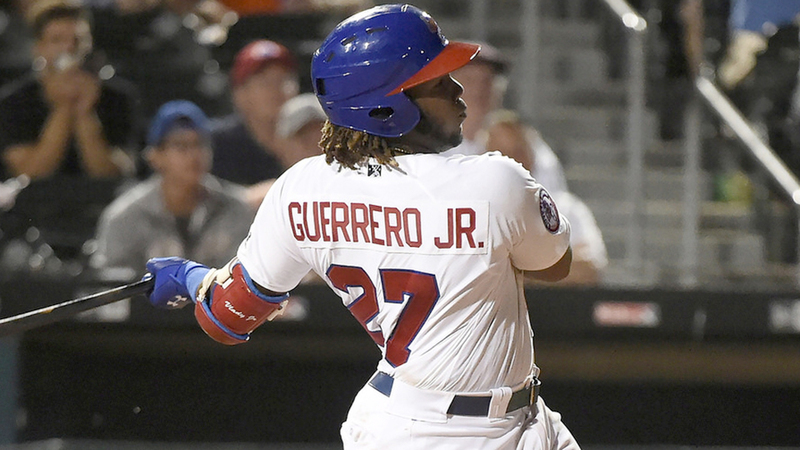 .381, Vladimir Guerrero Jr., average: The Minor League landscape got incredibly wrapped up in Guerrero's chase to become the first Minor Leaguer to hit .400 over a full season since Aaron Pointer in 1961. At almost every mark of the season (excluding the roughly five weeks he missed with a knee injury), Guerrero amazed fans and evaluators for the way he dominated with the bat at just 19 years old. He batted .402/.449/.671 in 61 games with Double-A New Hampshire after being the only teenager on an Eastern League Opening Day roster and went on to produce a .336/.414/.564 line in 30 games with Triple-A Buffalo, one step away from the Majors. His .636 slugging percentage and 1.073 OPS combined across all levels that led full-season Minor League qualifiers could have been featured here instead. But 100 years after the birth of Ted Williams, there's nothing quite like a quest for .400, and the son of another Hall of Fame outfielder provided that excitement this summer. .996, Eloy Jimenez, OPS: Most of the numbers featured here will be overall statistics for a full season. This, however, just comes from Jimenez's time with Triple-A Charlotte. Over 55 games and 228 plate appearances -- no small sample -- the 21-year-old right-handed slugger produced a .355/.399/.597 line with 12 home runs. Michael Reed (.997) was the only International League slugger to amass a higher OPS among the circuit's 158 batters with 200 plate appearances or more this season. Why highlight this? It's worth realizing how good the top White Sox prospect was over a sizable sample at the Minors' highest level in the same week the organization announced it wouldn't be bringing up Jimenez to the Majors during September roster expansion. And while general manager Rick Hahn seemed to hint MLB.com's No. 3 overall prospect was being held down for defensive reasons (rather than the more likely concerns about starting his service-time clock), it's also worth considering half his 12 career outfield assists came this season between Charlotte and Double-A Birmingham. 1.45, David Parkinson, ERA: Parkinson entered the season as an unranked pitching prospect and a little thought-of 2017 12th-round pick. He's now the Phillies' No. 19 prospect and -- perhaps even more importantly -- the Minor League full-season ERA leader. The 22-year-old southpaw's 1.45 mark over 124 1/3 innings was the fourth-lowest among full-season Minor Leaguers since the 2005 season. You may have heard of the pitchers who posted the three lower numbers. Jon Duplantier (1.39, 2017) stands as the No. 67 overall prospect. Blake Snell (1.41, 2015) ranks third in the Majors with a 2.02 ERA as part of his breakout All-Star season for the Rays. Justin Verlander (1.29, 2005) has won Rookie of the Year, Cy Young and AL MVP honors as well as a World Series ring during his 14-year Major League career. Since none of his pitches currently grade out as plus, Parkinson might not have the stuff of that trio. He does have similar results, however, and that's one heck of a way to start a career. 8, Ranked Braves pitching prospects to appear in Majors: At the start of the season, Atlanta had 16 pitchers ranked among its top-30 prospects. As of this week, eight had been called up to the Majors at some point this season. They were Mike Soroka, Kolby Allard, Luiz Gohara, Max Fried, Kyle Wright, Bryse Wilson, Touki Toussaint and A.J. Minter. Part of that had to do with the Braves pushing up their rebuild plans to make a run at the National League East this season. It's unlikely Wilson, Toussaint or Wright debut in 2018 otherwise. But the club signaled it had at least some plans to be aggressive when it brought up then-20-year-old Soroka on May 1 after less than a month at Triple-A Gwinnett. Interestingly, it's probably the only tacked-on reliever among this group in Minter who has made the most impact on the Major League club with 12 saves since moving into the closer role. 19, Juan Soto, age at Major League promotion: Time to come clean. Back in April, this Toolshed column asked whether anyone would eclipse Ronald Acuña Jr. as the Major Leagues' youngest player in 2018 and put Soto under the category of "MLB.com's Top-100 prospects who are younger than the Braves outfielder but are extremely unlikely to debut in the Majors this summer." To be fair, Soto had only been promoted from Class A Hagerstown to Class A Advanced Potomac on April 23, three days before that story ran. The 19-year-old outfielder moving up to Double-A Harrisburg on May 10 and jumping straight to the Majors 10 days later seemed like a pipe dream. Of course, that's exactly what happened. Soto has kept his spot with the Nationals ever since, hitting .299/.419/.512 with 16 homers in 94 games and running alongside Acuña in the NL Rookie of the Year race. He's been the only player to appear in the Majors at that age this year. 36, Peter Alonso/Ibandel Isabel, home runs: Was there a more dramatic race this season than the one that crowned the Home Run Kings? Not likely. Isabel had a three-homer advantage with four days left on the Minor League calendar, only to have Alonso catch him by homering twice on Aug. 31 and once more on a walk-off shot Monday that ended the 2018 campaign (and Cashman Field's run as a Minor League park) in style. Both players finished two long balls clear of third-place Casey Golden. Alonso snares the Joe Bauman Home Run Award via the RBI tiebreaker (he led the Minors with 119 while Isabel finished with 78), but that shouldn't discount what Isabel did. The Daytona slugger set a Florida State League record with 35 blasts (the other one came with Rancho Cucamonga) and hit 15 more dingers than anyone else on a Class A Advanced circuit that is notoriously not a hitters' league. 36.3, Josh James, strikeout rate: Include short-season qualifiers, if you want. Bring the innings requirement down to 75 innings, if need be. The truth is no Minor League starter struck out batters at a better clip than the Astros' No. 6 prospect this season. James fanned 171 over 114 1/3 innings between Double-A Corpus Christi and Triple-A Fresno this season and earned his first Major League callup and debut on Sept. 1 as a result. (He struck out nine over five innings against the Angels in that bow.) The 2014 34th-rounder has talked at length about how treating sleep apnea helped his stuff make a jump, and indeed, he has seen his velocity jump to the point where he was averaging 97.2 mph on his fastball in his Major League debut. He also sports two above-average pitches in his slider and changeup, and that package makes for an intriguing rotation option going forward for Houston. 70, Myles Straw, stolen bases: Is it possible for speed to be quiet? Straw has earned plus-plus grades for the tool and entered the season with his career high for thefts being 38, but he blew past that with a Minors-best 70 between Double-A Corpus Christi and Triple-A Fresno. No one else in the Minors had more than 55 this season. What's more, Straw was only caught nine times, so this wasn't just an issue of raw compilation. He was incredibly efficient as well. Yet because of a light-hitting approach that saw Houston's No. 14 prospect bat .257 with a .317 slugging percentage at Triple-A, his name doesn't come up among the flashiest prospects at the upper levels. Still while other teams make Minor League moves for potential pinch runners down the stretch -- as the Cubs did for Terrance Gore or the Yankees with Quintin Berry -- the Astros should have one ready to go, should they decide to call him up after Fresno's postseason run. 71, Alex Kirilloff, extra-base hits: A year ago this time, the Twins' No. 2 prospect was still on the comeback trail, having missed the entire 2017 season after undergoing Tommy John surgery. While the elbow procedure isn't as detrimental to position players as pitchers, it still wasn't a sure thing that Kirilloff would hit the ground running in essentially his first full season. Instead, he did more than that, leading the Minors in extra-base hits with 20 homers, seven triples and 44 doubles over 130 games between Class A Cedar Rapids and Class A Advanced Fort Myers. Now ranked as the No. 30 overall prospect after opening 2018 outside the Top 100, Kirilloff undoubtedly has one of the Minors' sweetest left-handed swings, and while this level of extra-base production will be tough to replicate at the upper levels, he's built himself quite the foundation post-surgery. 72, Nick Madrigal, career-opening plate appearances without a strikeout: "I know the White Sox drafted me for a reason," Madrigal told MiLB.com in an outtake earlier this week. Those reasons included the former Oregon State infielder's incredible ability to put the ball in play and pick up lots of hits along the way. After all, he did strike out in only 5.2 percent of his college plate appearances while batting .361 over three seasons in Corvallis. The 5-foot-7, right-handed hitter carried that part of his game to the pros quite quickly by not striking out in, yes, 72 straight plate appearances to open his career from his season debut in the Rookie-level Arizona League on July 5 all the way to his second plate appearance in his second game with Class A Advanced Winston-Salem on Aug. 4. He ended his first professional summer hitting .303 with only five total punchouts in 173 plate appearances across three levels. 170, Michael Kopech, strikeouts: Here's the problem with Minor Leaguers and counting stats. If the players do well enough at the upper levels, there's a chance they might get called up to the Majors. To be clear, that's good news. But such a transaction might allow them to get passed in certain Minor League categories. Take the case of Kopech. The No. 2 White Sox prospect led the Minors in K's with 170 in 126 1/3 innings with Charlotte before he got the Major League call on Aug. 21. His next three starts all came with Chicago, and when the Minor League season ended Monday, it was Dean Kremer (who sat 16 behind Kopech in the K category upon his promotion) who finished atop the leaderboard with 176. Still, Kopech's prowess for the whiff -- helped by his triple-digit heater, plus slider and improving changeup -- will be more memorable for the way it forced Chicago's hand in the season's final weeks.